Background: A novel system for the usage of Maximum Power Point Tracking of an expansive Solar Photo Voltaic (SPV) farm subjected to conceivable incomplete shading is displayed in this paper. The SPV farm being spread over an expansive territory a remote sensor organize is utilized for checking the sun based protection in the region of each board. The motivation behind the remote sensor organize is to screen the sunlight based protection at various areas near each of the PV board from the tremendous region of the photograph voltaic homestead comprising of countless voltaic boards. The observed protection information is utilized by a prepared. Artificial Neural Network to locate the ideal DC terminal voltage to be kept up over the general DC terminals of the photograph voltaic ranch. All the PV boards are associated in arrangement association with the fundamental bye pass diodes. The DC control accessible at the yield terminals of the SPV cultivate is first DC to DC changed over with a Positive Output Luo Converter (POLC) and bolstered to a heap. A MATLAB Simulink based reproduction was created to approve the proposed system. Methods: Maximum Power Point Tracking based on Artificial Neural Network through wireless sensor networks. Results: As the result of the proposed idea and its implementation in MATLAB we have two sets of results. In either case the input is a vector of 40 elements and the output of the first segment of the work is the estimation of the threshold PV terminal voltage that will guarantees maximum power point operation. In the first case we have the MATLAB SIMULINK implementation of the basic configuration of the forty PV panels arranged in series connection and we have provided a facility to edit the solar insulation levels pertaining to the individual PV panels. In this first configuration we have set a continuously variable PV current for all the panels and the PV current for all the panel are the same. Using this setup, for any combination of solar insulation pattern of the forty panels the overall PV curve and the overall VI curve can be drawn in MATLAB. As the simulation runs the PV current is changed from 0 to the maximum or the short circuit current level in a slowly rising manner implemented using a ramp signal. During this period the total power output and the terminal voltage of the PV farm are sent to the work space and the data is thus collected in the workspace of MATLAB. Using basic MATLAB commands the maximum power output and the PV terminal voltage corresponding to the maximum power output are obtained. The PV current at maximum power output condition, the corresponding PV farm terminal voltage, the maximum power output recorded at this condition all correspond to the present insulation vector condition. This way, by changing the elements of the insulation for all the forty panels in a random manner we obtain for each case the Ipmax[i], Pmax[i], Vpmax[i] and this corresponds to insulation[n,i]. Where n is the number of panels, in this case 40 and i the ith experiment. In each experiment the solar insulation level of all the forty panels can be changed and the parameters Vpmax[i], Ipmax[i] and Pmax[i] can be obtained. The value of the harvested power as found from the characteristics for any given set of insulation is denoted as the estimated power. The value of power as obtained from the proposed ANN SMC POLC combination is denoted as the Actual Power. Conclusion: A wireless network based insulation monitoring has been done. An ANN based MPPT algorithm has been developed that gives the reference MPP voltage. The sliding mode control scheme uses the reference voltage and produces the switching pulses for the POLC. The ANN had been trained with a number of combinations of different insulation values falling on each of the forty panels and the ANN gives the correct reference voltage for any combination of insulation levels that were not used while training. The sliding mode controller uses this reference voltage and gives the switching pulses to the POLC that harvests the maximum power output to the RL load. The proposed system has been implemented in the MATLAB SIMULINK environment and has thus been validated. The obtained results have been compared against the maximum power output values that could be derived from the characteristic curves obtained for the given combination of insulation levels. The proposed system gives results very close to the values obtained from the characteristics. As a future work the proposed idea can be validated using hardware based experimental setup. Keywords: Solar photo voltaic farm, wireless sensor network, unequal solar insulation on PV panels, artificial neural network, maximum power point tracking, sliding mode controller. Keywords:Solar photo voltaic farm, wireless sensor network, unequal solar insulation on PV panels, artificial neural network, maximum power point tracking, sliding mode controller. Abstract:Background: A novel system for the usage of Maximum Power Point Tracking of an expansive Solar Photo Voltaic (SPV) farm subjected to conceivable incomplete shading is displayed in this paper. The SPV farm being spread over an expansive territory a remote sensor organize is utilized for checking the sun based protection in the region of each board. The motivation behind the remote sensor organize is to screen the sunlight based protection at various areas near each of the PV board from the tremendous region of the photograph voltaic homestead comprising of countless voltaic boards. The observed protection information is utilized by a prepared. Artificial Neural Network to locate the ideal DC terminal voltage to be kept up over the general DC terminals of the photograph voltaic ranch. All the PV boards are associated in arrangement association with the fundamental bye pass diodes. The DC control accessible at the yield terminals of the SPV cultivate is first DC to DC changed over with a Positive Output Luo Converter (POLC) and bolstered to a heap. 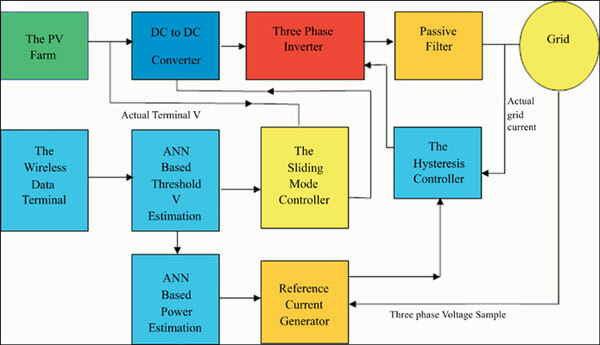 A MATLAB Simulink based reproduction was created to approve the proposed system.